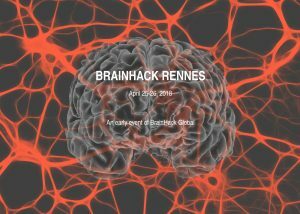 We are pleased to organise this year Brainhack Rennes 2018 (April 25-26 at INRIA/IRISA, campus Beaulieu, Rennes, France), an early event of Brainhack Global 2018. Brainhack events convenes engineers, researchers and clinicians to work together on projects related to neuroscience. Are you are interested in sciences and neurosciences? Come and learn about existing tools or bring your own projects and find passionate people to join in. There are a lot of open data available (e.g. 101 nights in EEG, FC 1000 in fMRI, OASIS in anatomical MRI, etc. ), waiting to be analysed ! Are you looking for contributors on an existing software? Would you like to meet new collaborators? Do you have open questions in your research? Come and discuss with us during these 2 days. After the workshop, it will be possible to write a report summarizing your project that will be published as a special issue on Brainhack Global. To hear more about the projects in last year’s Brainhack see: https://riojournal.com/collection/6/.